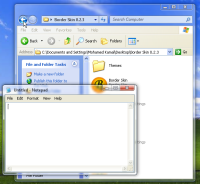 Border Skin is a free portable software to skin the windows borders by skins composed of png images with the support of several features like Blur, Reflection and Aero Explorer, it supports Windows XP/Vista/7/8. The original purpose of BorderSkin was to simulate aero interface on windows xp. however with the upcoming release of windows 10, this doesn't really have much value anymore, so there must be a new vision to work towards to. 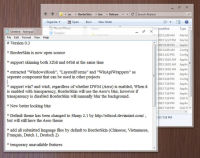 One of the top features that distinguished BorderSkin was Aero Explorer, because it added real the vista explorer controls like breadcrumbs on the borders of XP explorer windows. However, the real power of this feature wasn't just the vista controls, but the ability of creating custom controls and put them on the windows borders. So the new goal is to provide the ability through plugins to create custom controls to be added on windows borders, whether these controls was to specific window type (like explorer) or for all windows. Of course the normal features like blur are still maintained. If you have an idea (even if it was a small one) of what BorderSkin goal can be, please don't hesitate to discuss it in the GOAL issue or send me by email. Checkout the opened issues, if you decided to work on an issue, please comment.